One of the things that makes being a parent fun is finding ways to make the kids laugh. M and M had so much fun with the silly jokes for kids, the spring jokes and the riddles for kids I made into printable lunch box notes. I decided to keep the fun rolling and made a batch of knock, knock jokes for kids. Of course, a lot of them are favorites from when I was a kid, but some of them are brand new to me. This knock knock jokes for kids post was such a fun post to put together. I was smiling the entire time. (I even chuckled a bit a the very best knock knock jokes). I hope you enjoy them as much as I did! Click here to print these 20 jokes + 11 more! I’m always on the lookout for ways to put books in my kids hands. These joke books (including a knock knock jokes for kids book) are perfect for getting the kids reading and laughing at the same time. Add your favorite knock, knock jokes for kids into the comment section! Thanks for the jokes! That was fun with the kids. I have a Knock, Knock Joke! You start it! Hi! Your jokes is funny! To get to the other side…. 4 yr old son got this joke by himself, IM PROUD! knock knock. Who’s there? Barbie. Barbie who? BBQ chicken. Knock Knock… Who’s there… Pork… Pork who… Pork Chop! Bwahaha! That’s also what you’d call a pig that knows kung-fu! I like this jokes there so jalarious. It is a shame coz my children didn’t enjoy ‘me. Shame coz I loved them! Orange you glad I didn’t say banana again. What does a pirate say when he turns 80??? Aye, Matey! Dwaine the bathtub, I’m dwoning!! My kids really got a kick out of this one!! Thanks! Knock knock. Who’s there? Smell mop. Smell mop who? EW! I don’t want to smell your poo! My kids will laugh about this one for days. Her mom (my sister) finds it amusing when she does it to her dad, because he gets ALL offended! Eww! I don’t wanna smell your poo!! How you make a tissue dance? i loved using that joke for Halloween when i was younger! Dora’s locked. That’s why I’m knockin. I use to always say that to people when I went tricker treating every year and I still do today ?? You said this on my birthday bless you Stacie ???????????? Oh my husband is going to love this one! Thanks for sharing. I ate a bucketoff who? You ate a bucket of poo? Eeeewww! Love this one!! I am a Hawkeye fan as well!! KNOCK KNOCK. WHO’s THERE. SEENYA. SEENYA WHO?John SEENYA don! Knock knock? Who’s there? Dwayne! Dwayne who? Dwayne the bathtub quick! I’m dwownding!!!! Knock knock. Who’s there? Howard. Howard who? Howard you? Knock knock. Who’s there? Mary. Mary who? Mary Christmas! My four year old really enjoyed those! Thank you. That one cracks me up ! My kiddos love this one. I didn’t happen to see this one but it is one of our favorite in our house: Knock, Knock. Who is there? Goliath. Goliath who? Goliath down you look tired. Always gets a giggle still even though the kids are 10 & 13 now:). Shouldn’t that be “Goliath down, thou looketh tired”? Want to hear a great knock knock joke? Eyes got another knock knock joke. Ears another knock knock joke. I nose another knock knock joke. Orange you glad I don’t know anymore knock knock jokes? Knock Knock whose there boo boo who why are you crying! Panther no panth I’m going thwimming. My 7 yr old LOVES that one! When my now 25 year old boy was 4 he told this joke. He was VERY proud that he had made it up himself. We constantly tell this joke to a now 6 ft tall sailor! why di the chicken cross the road? To show the possum it could be done. My 2 year old came home from preschool with this one, many years ago. She thought it was hysterical and would laugh over and over. My 8 Year sold asked me to add her jock. do you know why did Susie put sugar on her pillow ? because she wanted to have sweet dreams. which day do the chickens hate most ? these are some funny ones!!!!! I told, and heard, lots of knock knock jokes over my LONG life, but I must be missing something. I just don’t get the interrupting pirate….ARRRGGHHH….joke. Has old-timers finally got hold of me????? Knock knock. Who’s there? Hatch. Hatch who? Bless you. Knock knock. Who’s there? Chooch. Chooch who? Hello little train. knock knock who’s there?crush. crush who? crush you!!!!!!!! those are good one i really like the last joke. Daisy see me rolling they hatin! For all the Doctor Who fans out there. My kids love this one. Adolph ball hit me in the mouf dat why I talk dis way. This is just fun, I’m sharing with my readers! Thanks! Juneau the capital of Alaska? knock,knock. who’s there? donch.donch who? donch you have a dentist to go to! This is the funniest collection of comments I have ever read. The jokes just kept coming and coming. My kids were amused. Too short to reach the doorbell!! this makes everyone a school crack up! Knock knock.whos there.eouripe.eouripe who . No your a poo. Knock knock. Who’s there? Panther. Panther who? Panther no panth, I’m going thwimming. You poo, why are you telling me? you all can’t tell jokes this is a real joke Knock,Knock. who is there? Home work. home work who? Come do your homework. Um just for the record Google’s better!! Knock knock. Who’s there. Dog puhh. Dog puhh, who? Eewww. You said dog pooh! Knock knock. Who’s there? Doris. Doris who? Doris shut that’s why I knocked. Nice list of knock knock jokes. I love these jokes, i make my friends laugh and we lol together. how did you know its me? Thanks for the knock knock jokes. I use them to send to a little girl that was abused. It helps brighten her day. Knock knock…. who’s there…. Cash… Cash who? What’re you, some kind of nut??? You’re not crying for real. Knock knock, whos there .? Olive ,olive who? nicole never bothered me anyway ! I love it it was sooooooo good send me more! These are so funny I was laughing just looking at these I loved the banana one!!! ??? P.S. I have a joke how do wit describe a earwig answer: an aerie bug get it eary bug ?❤️???? My 8 year old Grandson tells me this joke at least 10 times a day…it’s not a knock knock joke…but it is funny…What do you call a cow with no legs?….Ground beef! …..he loves it and cracks up every time he says it. Europe who? (You’re a poo). Do you also have jokes for big kids like me(25 y)? We tried to perform a ‘Knock knock’ joke, but you weren’t in. Please …. collect the punchline from our depot from 7am – 3pm, Monday – Thursday. I love all these jokes now i can beat my brother at knocks-thanks!!!!!!!!!!!!!! Knock knock! Who’s there! Willis. Willis who! Will this joke make it to the top! Harry-up and open the door ! you have filled my joy I cannot believe how happy I am right now, first time in a long time I have laughed in a long time what a crack up haha CLASSIC. THE CHICKENS MAD ALREADY WILL U PLZ OPEN THE DOOR!!!! Why did the sea blush? That is impossible. Opportunity doesn’t come knocking twice! P1 – Will you remember me in a second? P1 – You said you would remember me!! Mary Christmas and a Abby New Year! My daughter loved this joke. My kids are so into puns amp; knock-knock jokes they #39;ll love this and minimal work for me to keep up with! I really liked those jokes I think so. Hahaha!! These are great. I know my boys will enjoy them. Thank you! 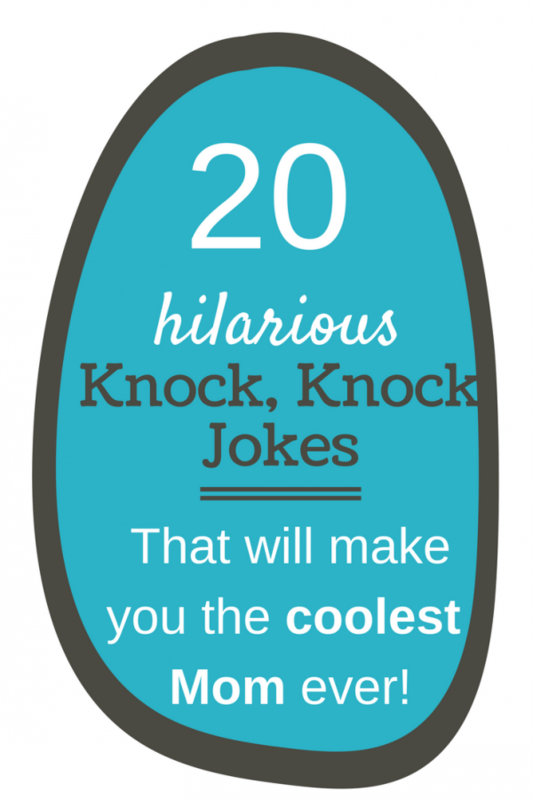 Keep the fun rolling with 20 printable knock knock jokes (+10 bonus jokes).